City Train Leeuwarden - De toeristentrein van Leeuwarden. City Train Leeuwarden makes a beautiful ride through the historic center of Leeuwarden. You will see the famous leaning tower, the Oldehove. You will also pass the beautiful canals, flanked by many national monuments. Like ‘de Waag’ building, for example. And of course we drive over a mound. We also take you along the birth house of Mata Hari, the beautiful Chancellery and the former prison ‘de Blokhuispoort’ and much more. The tour takes about 45 minutes. The text can be listened to in Dutch, French, German, English and Frisian. 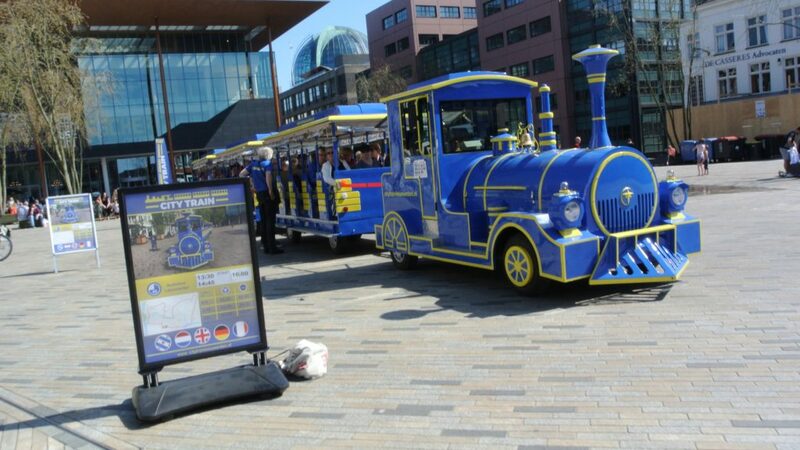 The train runs from April until the end of October. 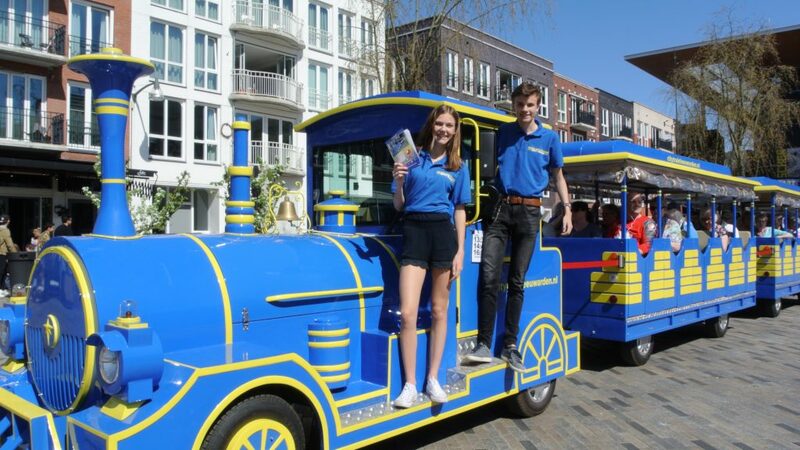 You can buy tickets at the tourist information, the local shop ‘Friese Streekwinkel Priuw’ and at the train on the Wilhelminaplein (square). Tickets are not time-bound. In high season it is wise to be present on time. You can board the train half an hour before departure. 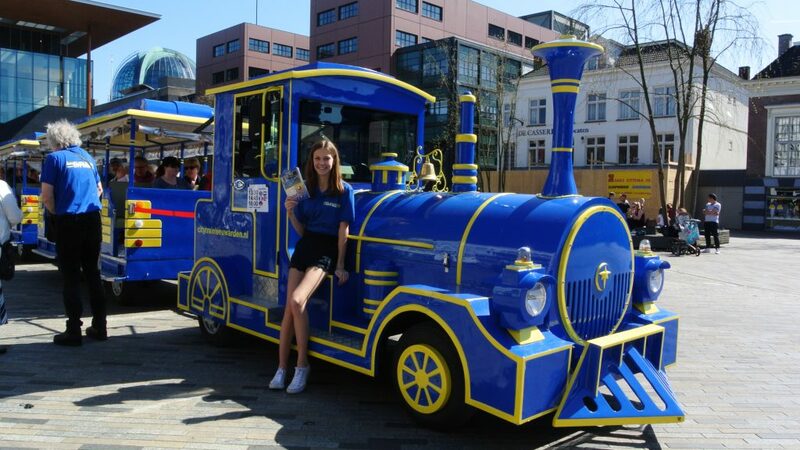 Groups of at least 15 adults will get € 1.00 discount per person. Reservation in general is not necessary. If you are on time, there is usually enough room. Groups can book in advance, see our 'contact'. Under the Wilhelminaplein, our departure point, is a parking garage called 'P-Zaailand'. On the Wilhelminaplein there is also a free (guarded) bicycle parking. The train has a maximum of 60 seats. Rollers and wheelchairs are taken by the staff after boarding and with a chain lock attached to a fixed object. If you request in time, it is possible to stop / or start elsewhere. In the high season (June-August) getting in and / or disembarking elsewhere is limited, possible due to the crowds.